Novomatic’s Seven’s slot game is a simple, classic online slot game that resembles an old-school land-based slot machine. It has 3 reels and 5 paylines and is perfect for beginners as it’s easy to understand, entertaining to play and gives you plenty of big wins! 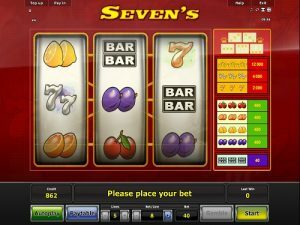 Seven’s slot game is filled with old-school slot symbols, such as fruits and, of course, sevens! Even the sound effects in Seven’s slot game is evocative of an old-school slot machine and you’ll feel as if you’re right there in an 80s games arcade! Players who enjoy our other Novomatic online slots, such as: Fruit Fest, Fruits ‘n Sevens and Plenty of Fruit 20 will enjoy this game a lot. Even if you’re not a beginner, you’ll enjoy this game. After all, slots don’t need to have tons of bonus games and features to do what they do best – give you big wins! There are so many classic slot symbols in Seven’s slot game, players who like retro games will go crazy for this one! From the lowest-paying symbol to the highest-paying symbol, there are: the bars, the cherries, the lemons, the plums, the oranges and then the sevens themselves! There are three different seven symbols: one bronze seven, two silver sevens and three golden sevens! The golden sevens pay out the most – when you spin three of these symbols, you’ll get a payout of x300 your bet! The aim of the game is to spin three matching symbols on an active payline. Payouts vary according to bet size and symbols, of course. You can look at the paytable if you want to see how much each combination of symbols will pay. If you want to change your bet, it’s easy. Just use the plus or minus symbols to increase or decrease the amount you’re betting per line. You have to bet on all five lines at a minimum of 0.02 per line so the minimum bet per spin in Seven’s slot game is 0.10. This game, brought to you by NovomaticCasino.co.uk, was developed by Novomatic and therefore has some of their most classic features. At the bottom of the screen, you’ll be able to see your credit balance along with your bet amount and last win amount. Every time you get a win, you can choose to gamble it with the 50/50 gamble feature. In Seven’s slot game, you’ll need to guess between red and black as to the colour of the next card! If you get it right, you’ll times your win by two! Before you play for real money, you can play for free to get an idea of the game and then go for those big wins! Once you’re an expert and you’re comfortable with your bet, you can put the game into autoplay mode and let the reels spin themselves automatically without you having to lift a finger! Here at NovomaticCasino.co.uk, when it comes down to games, we’re all about all things Novomatic! Our extensive slots selection is full of the best online slots which includes all the player favourites like: Book of Ra Deluxe, Lucky Lady’s Charm Deluxe and Dolphin’s Pearl Deluxe. Our table games offer really great RTP (return to player) percentages and our live casino games give players the very best, most authentic live casino experiences! You can play a number of the most popular land-based casino games, live and from the comfort of your own living room, without even getting dressed! Choose between Live Poker, Live Blackjack, Live Roulette and Live Baccarat. Sit at the table and place your bets! What’s more, we also have a large selection of mobile games which you can play on the go – gaming doesn’t all have to be about desktop anymore, play on any device from anywhere!